There was a time when pro gamblers and gamers had a strategy of sitting in smoky rooms and warming up with a full American breakfast. But this is 2019 -- and those days are over. Poker pros are more likely to be into Buddhist meditation, yoga and working out before they hit the tables with a winning strategy and mindset. The Vagus nerve is one of the most important nerves in your body. It has the power to activate the nervous system and trigger feelings of well-being and calm -- just what a gamer needs for peak performance. Yoga practitioners recommend a range of moves, but casino players can opt for simple breath exercises achieve these benefits during sessions. Try to slow your breathing down to 5-7 breaths per minute; inhale for 5 seconds and exhale for 10. You can get extra effects by stretching your arms above your head and gently tilting your neck back. Isometric exercise -- where a muscle is contracted hard, held and then relaxed -- is a proven way to enhance muscle strength and improve muscle tone. As a bonus, alternating tension with relaxation is a well-known progressive calming technique. You can perform isometric exercises while you play: contract your bicep muscles (front of arms), pectorals (chest) and quadriceps (front of legs). Tense hard and hold for 20-30 seconds; that's one set. You can work one or more muscle groups multiple times during a gaming session. Calf raises are a simple exercise that can be performed while sitting at a desk or in a chair while playing casino games. In addition to building up and toning muscles, calf raises can help to maintain circulation and reduce the stress that can build up while staying seated for prolonged periods of time -- such as when gambling. For optimal impact, extend your ankles so that you are on your tip toes and squeeze your calf muscles as hard as you can for 2-3 seconds before lowering; repeat 20 times or until your calves are fatigued. Rest for a minute and repeat. Over time, you should be able to perform hundreds of strict reps during a gaming session. Gamify your exercise by trying to beat your score each time. Standing desks have become all the rage thanks to scientists suggesting that standing has some real benefits compared to sitting. Among them: better mental performance, burning calories, lowering blood pressure, reducing stress and even the potential to increase life expectancy. This is where mobile gaming via phone or tablet can be a winner. If you spend 30 minutes playing while standing, you're effectively getting in some exercise. The mere act of standing up burns more calories than slouching in a chair! You can also perform some squats while you game and see how many you can do during a 30-minute casino session. 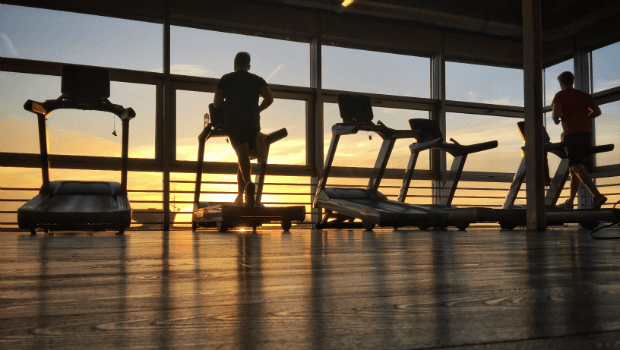 If you want to do cardio to get fitter and burn fat, then cardio machines such as treadmills, bikes and cross-trainers are the classic way to go. However, not many people love low-intensity cardio, especially if it's done before breakfast; working out slowly and steadily for 45 minutes while fasting can be a challenge (not to mention boring). A sneaky way to forget about time and burn calories is to play some simple casino games during cardio -- slots, keno and scratch cards, for example. Select a machine that has a holder for your mobile device. Not only can you switch comfortably from casino games to YouTube to movies, but you'll get the cardio done at the same time.